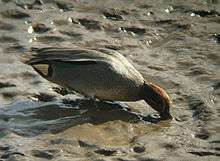 Male common teal producing feeding traces on a River Tyne mudflat. Bird ichnology is the study of avian life traces in ornithology and paleontology. Such life traces can include footprints, nests, feces and coproliths. Scientists gain insight about the behavior and diversity of birds by studying such evidence. Ichnofossils (or ichnites) are especially important for clarifying the evolution and prehistoric diversity of taxa. These cannot usually be associated with a particular genus, let alone species of bird, as hardly ever they are associated with fossil bones. But it is possible to group them into ichnotaxa based on their morphology (form). In practice, the details of shape that reveal the birds' behavior or biologic affinity are generally given more weight in ichnologic classification. Bird footprints typically have a wider angle between the toes. These goose tracks show that webs do not necessarily leave an impression. 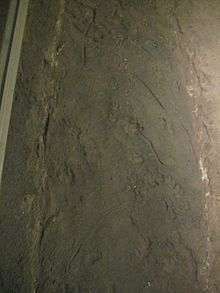 Grallator are the footprints of a Coelophysis-like theropod, initially mistaken for those of a ratite bird. These fossil traces of birds are sometimes hard to interpret correctly, especially when they are from the Mesozoic when the birds' dinosaurian relatives were still in existence. Nests at least of Neornithes are usually quite easy to identify as such due to the unique structures of their eggshells; there is some uncertainty as regards the origin of certain Mesozoic eggshells, which makes nests of this age problematic. Mesozoic fossil footprints are hardest to attribute. "Proto-bird" and related theropod feet were very much alike; non-avian theropod tracks such as the ichnogenus Grallator were initially attributed to ratites because in the early 19th century when these were described, the knowledge about dinosaurian diversity was marginal compared to today, whereas ratites were well-known. Also, under the creationist dogma, scientists would believe that e.g. rheas had been around for all eternity. In the Jurassic and Early Cretaceous, juvenile non-avian theropods left very birdlike footprints. Towards the end of the Cretaceous, the tracks of aquatic birds are usually recognizable due to the presence of webbing between the toes; indeed, most avian ichnotaxa fall into this group. However, giant flightless birds also existed by that time, as evidenced by Gargantuavis; if the Gastornithidae were indeed close to Anseriformes, their lineage must also have been distinct by then. 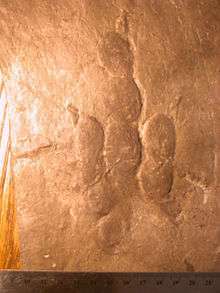 Such footprints may resemble those of non-avian theropod or even ornithopod dinosaurs. Among the former, the Ornithomimiformes (= "Arctometatarsalia" sensu stricto) were convergent to ratites in many respects, including the feet, and it is impossible to tell if some large bird-like footprints from the Late Cretaceous are from an ornithomimiform or a giant bird, without associated bone material. There exist documented tracks that appear avian since the Late Triassic, by some 55 million years predating the first proper evidence that very birdlike theropods were present. The Late Triassic and early-mid Jurassic tracks have been assigned to the ichnogenera Trisauropodiscus and Aquatilavipes. Few scientists would go as far though to consider these traces evidence that birds evolved much earlier than generally believed, and perhaps not from theropod dinosaurs as per today's mainstream opinion. In fact, it seems that the initial dating of these very ancient bird-like tracks was in error, and they seem to date from a much later time when modern birds were already known from bone fossils. if a hallux is present, it is directed straight backwards or nearly so. It is notable that Heterodontosauridae are known from the localities and times when the first avian-looking footprints started to appear. These small ornithopod dinosaurs were entirely unbirdlike, except for their ornithischian pelvis and a tarsometatarsus strongly convergent to that of Enantiornithes. Though some details remain unresolved, it is far more plausible that Trisauropodiscus etc. were made by a Heterodontosaurus-like animal rather than some sort of bird. Avian? Non-avian theropod (juvenile Grallator)? Heterodontosaurid? 5–6 × 4–5 cm (h/v). Toes long, narrow, small webs; no or very small hallux; T2-T4 100–140°; toe pads; step 20 cm. Avian: Patagopteryx? shorebird? 35 × 35 cm (h/v). Toes long, wide; no hallux; T2-T4 110°; toe pads; step 208cm. Avian: giant flightless bird? 2.3 × 3.5 cm (h/v). Toes narrow, unwebbed, T2+T4 shorter; no hallux; T2-T4 75–80°. Avian? perching bird? 25 × 20 cm (h/v). Toes long, very thin; no hallux; T2-T4 109–118°; step 200-217cm. Avian? 3.3–5.1 × 3.3–4.7 cm (h/v w/o hallux). Toes long, narrow, unwebbed; hallux small, high, backwards and inwards; T1-T4 270–320°, T2-T4 88–141°; step c.15 cm. Avian: shorebird? 3.5 × 3 cm (h/v). Toes narrow, unwebbed, T2 separated (higher); no hallux; T2-T4 100–120°; step 20 cm. Avian? 30 × 25–30 cm (h/v). Toes long, thin; hallux sideways; T1-T4 130–170°; T2-T4 90°; deep heel; toe pads. Avian? No hallux. Avian: enantiornithine? neornithine (galliform)? Web impressions present; Avian: presbyornithine? Web impressions may be present; Avian: anseriform? charadriiform? c.10 × 9 cm (h/v). Toes long, thin, may be partially webbed; hallux small, backwards; T1-T4 190°; T2-T4 130°. Avian: large stork-like wading bird or basal waterfowl. c.27 × 32 cm (h/v). Toes long, wide; no hallux; T2-T4 65°; deep heel; toe pads. May be from Gastornis; validity disputed. Web impressions present; Avian: anseriform? 6 × 5 cm (h/v w/o hallux). Toes long, narrow, unwebbed or partial small webs, T2 smaller; hallux backwards and high; T1-T4 220°, T2-T4 130–145°; toe pads; step 33 cm. Avian: Neuquenornis? shorebird? Fossil eggshells are not actually ichnofossils. As they preserve direct evidence of an organism's physiology, their shape, size and the structure of the eggshell give more robust clues to their origin than do footprints. Typically, fossil eggs can be quite unequivocally assigned to a specific group of organisms, e.g. chelonians, squamates, dinosaurs, crocodiles, pterosaurs or (modern) birds. † Oolithus (Late Jurassic of England) – avian? † Dispersituberoolithus (Oldman Late Cretaceous of S Alberta, Canada) – neornithine? † Gobioolithus (Late Cretaceous) – paleognath? † Tristraguloolithus (Oldman Late Cretaceous of S Alberta, Canada) – galliform (cracid)? † Incognitoolithus (Eocene of North America) – ratite? † Type A ("aepyornithoid") eggs (Tsondab Early Miocene of Namibia – Pliocene of Asia) – ratite? † Namornis (Middle Miocene of Namibia – Late Miocene of Kenya) – ratite? † Diamantornis (Middle Miocene of Namibia – Late Miocene of UAE and Kenya) – ratite? Wikimedia Commons has media related to Bird tracks. ↑ Payros, Aitor; Astibia, Humberto; Cearreta, Alejandro; Pereda-Suberbiola, Xabier; Murelaga, Xabier & Badiola, Ainara (1930). "The Upper Eocene South Pyrenean Coastal Deposits (Liedena Sandstone, Navarre): Sedimentary Facies, Benthic Foraminifera and Avian Ichnology". Facies. 42 (1): 19–23. doi:10.1007/BF02562569. ↑ Similar footprints, now lost, were reported from roughly contemporary strata in France in the 19th century: Buffetaut, Eric (2004). "Footprints of Giant Birds from the Upper Eocene of the Paris Basin: An Ichnological Enigma". Ichnos. 11 (3–4): 357. doi:10.1080/10420940490442287. ↑ Patterson, John & Lockley, Martin (2004). "A Probable Diatryma Track from the Eocene of Washington: An Intriguing Case of Controversy and Skepticism". Ichnos. 11 (3–4): 341. doi:10.1080/10420940490442278. Bühler, Paul & Bock, Walter J. (2002). "Zur Archaeopteryx-Nomenklatur: Missverständnisse und Lösung". Journal für Ornithologie. 143 (3): 269. doi:10.1046/j.1439-0361.2002.02006.x. Cockerell, Theodore Dru Alison (1923): The Supposed Plumage of the Eocene Bird Diatryma. American Museum Novitates 62: 1–4. Grimaldi, David A. & Case, Gerard Ramon (1995): A feather in amber from the Upper Cretaceous of New Jersey. American Museum Novitates 3126: 1–6. Wetmore, Alexander (1930). "The Supposed Plumage of the Eocene Diatryma" (PDF). Auk. 47 (4): 579–580. doi:10.2307/4075897.